Marketing Roadmaps does not accept paid advertising. From time to time, books mentioned in a Marketing Roadmaps post may include affiliate links from online booksellers, including Amazon and Barnes & Noble. If you purchase a book after following an affiliate link, I’ll earn a few cents. Any other links, buttons and badges to firms or sites are provided at no cost at the sole discretion of Susan Getgood. Marketing Roadmaps is entirely my opinion, based on my experience. It does not represent the policies and positions of any employer or client – past, present or future. 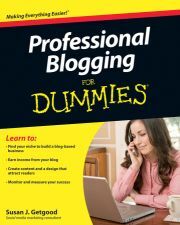 I am also a co-founder of Blog With Integrity, and the author of Professional Blogging For Dummies (Wiley, July 2010). If you subscribe to POSTS, you will get an email every time I post. This subscription is managed by Feedburner, your email address is used for no other purpose and you can unsubscribe at any time. If you subscribe to MONTHLY UPDATES, you will get an email every month (or so.) This subscription is managed by MailChimp, your email address is used for no other purpose and you can unsubscribe at any time. Marketing Roadmaps is my opinion, based on my experience. Your mileage may vary. I will be respectful of my readers’ views, and expect the same courtesy. When I have an opinion, I will be completely clear about it. You won’t have to guess. I won’t delete posts unless the content proves to be completely off base, in which case I will leave a placeholder that explains what happened so search engines won’t perpetuate any mistakes I have made. Typically I will annotate the original post with new material rather than delete the post. I will not blog information learned offline or in private conversations unless I am absolutely certain that it is public information or I have obtained permission from the person who shared the information. When in doubt I will err on the side of caution. I will not delete comments unless they are spam or off-topic. Ditto trackbacks. I will link and trackback to other blogs appropriately, and always endeavor to add to the conversation. I will say thank you, replying to emails and comments promptly and pleasantly, even when I disagree with you. I will be honest about my clients and relationships so my readers will understand my loyalties. Current clients: Please see my LinkedIn Profile for the list of current clients and advisory boards. Susan Getgood reserves the right to change this policy at any time, with or without notice.